Thorvaldsen was made a citizen of honour in several cities especially in Germany, while academies of fine art throughout Europe virtually vied with each other in their eagerness to appoint him a member. It was thus a famous European personality whom the City of Copenhagen appointed a citizen of honour on 21 November 1838. The visible proof of this distinction was this diploma, written on fine morocco and framed in oak. 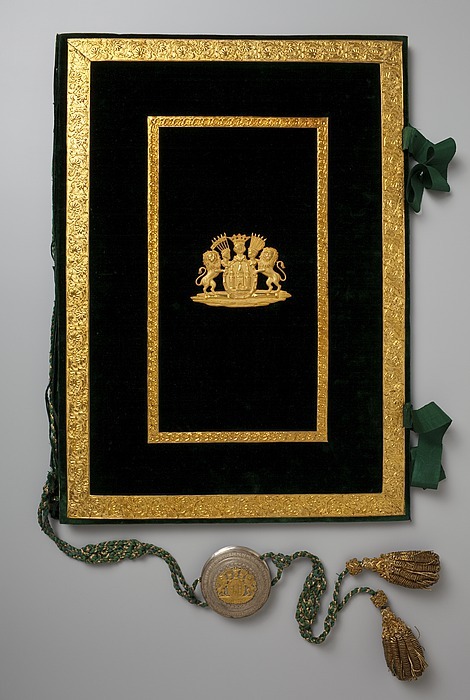 The diploma is furthermore enclosed in a box covered with dark green velvet and decorated with splendid gilt metal ornaments representing the seal of Copenhagen. Thorvaldsen was the first and so far the only person to be appointed a citizen of honour in Copenhagen.